The warmer weather is upon us so it is time to stock up the refrigerator and pantry with those extra ingredients needed for some new spins on traditional summer beverages. 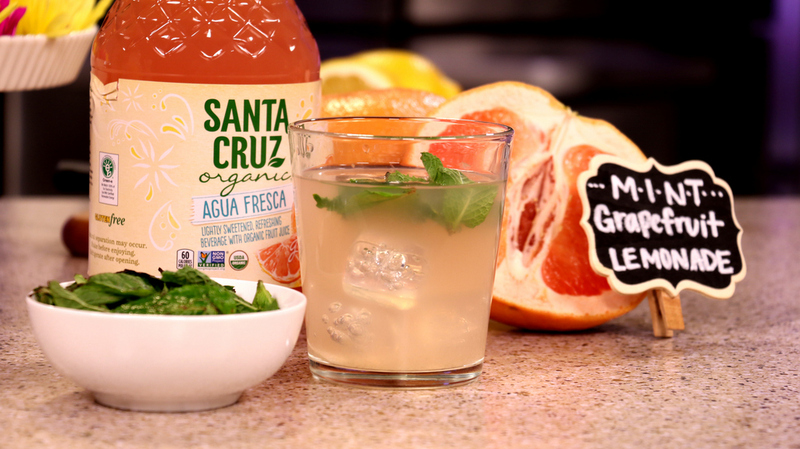 Have you tried agua fresca yet? The host of TLC’s Sunday Brunch, Ereka Vetrini just shared some amazing recipes featuring this product and a few seasonal goodies from my home garden. I’m excited to share these with you over the next 2 weeks so be sure to check back under the beverage category on my site. The Mint Grapfruit Lemonade is a personal favorite because I’m a big promoter in growing some fun container citrus like I have in my home garden here in Ohio. I hope you enjoy this recipe and be sure to share with your friends! Combine agua fresca beverage, lemon flavored beverage, mint leaves, and lemon slices. Add desired amount of ice. Stir to combine. Garnish with mint leaves. This drink is delicious when made for individual glasses or combined in a pitcher or carafe. Recipe and image credit : Ereka Vetrini / Santa Cruz Organic®. [alert-announce]Anxious for Summer… I hope this beverage puts you in that summer state of mind like it did for me! I’m all about connecting with others so please share a comment so I can stop by your blog or just know that you stopped by to read this recipe. Are you a recipe fan like me? Let me know what you are looking to cook up and I’ll share with you.